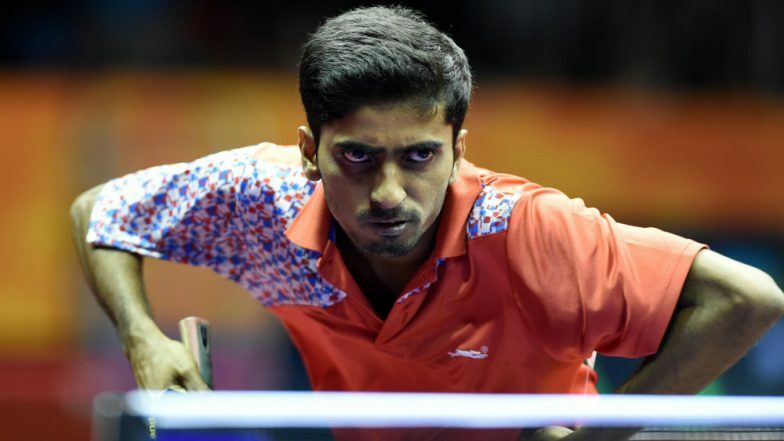 Kolkata, April 9: Sathiyan Gnanasekaran wants to be among the top 15 players in the world by the end of this year, but to achieve that, India's top ranked paddler knows all too well that he has to work on his fitness to brave the grind in the coming months. "I am looking at top 15 by the end of 2019 if I can continue this form. I am knocking on the door of top 20," the World No. 28 Sathiyan told IANS in an interview. Next Aim is to Break into Top 15 in the World: Paddler Sathiyan. "I need to step up my fitness levels as well to match up to the gruelling schedule ahead. That is something I need to work on if I have to get into the top 15," the 26-year old said. Sathiyan booked a berth at the World Cup after finishing sixth in the ITTF-ATTU Asian Cup held in Yokohama last week. The left-hander stunned World No. 14 Chun Ting Wong of Hong Kong in positions 5-8 match before losing to 17-year-old Lin Yun-Ju of Chinese Taipei, who notched up a 11-4, 11-8, 11-8, 14-12 win to finish fifth. "It was a tiring tournament, playing such high quality matches. All the matches were like playing semi final and final. I will watch the videos and comeback with better show when I meet him (Yun-Ju) next time," Sathiyan said. The next few months will be gruelling for Sathiyan with the World Table Tennis Championships, seven Pro Tours (China, Japan, Korea, Hong Kong, Australia, Bulgaria and the Czech Republic), Ultimate Table Tennis League and the Commonwealth Championships all lined up before the World Cup, which is slated to be held in Chengdu, China from October 18 to 20. "I have the World Championships (April 21-1 in Budapest, Hungary) coming up. Then I have three weeks maybe in Chennai. Then I have seven pro tours, the Commonwealth Championships ..so it will be a tournament packed few months," Sathiyan quipped. He further added that if he can do well in the World Championships, his ranking will shoot up. "I will have enough match practice before the World Cup. If I can do well in the World Championships, my world ranking will go up." On areas he wants to improve on besides fitness, Sathiyan feels his serves and receives can get better. "I want to work on my serves and receives. I also want to improve on my backhand serves." In January, Sathiyan reached a career best world ranking of 28 which is the best ever ranking achieved by an Indian in singles.